Things cool down a bit in September of 2014. Only 3 TFs this month. I think for the first time ever, all my purchases in a single month are figures where the alt modes are animals. Reminds me of the G1 episode “Call of the Primitives”. Rattrap was a nice find. His release was 4 or 5 months before this, and at the time he was quite rare. As a fan favorite he’s snatched up quick. So of course online dealers spared no effort jacking up the price, sometimes at well over $40. 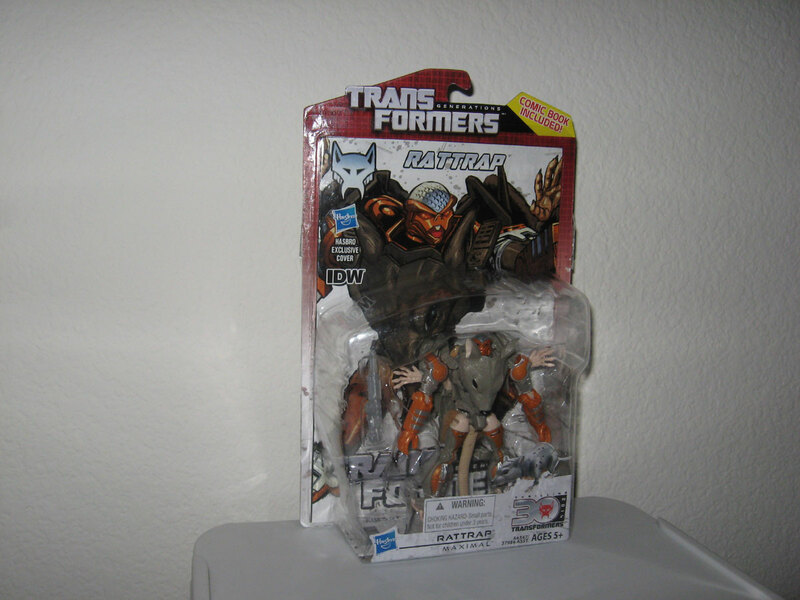 I first saw this Rattrap figure at BotCon, back in June of 2014. Price dropped a bit by then, but at the con he was still about $25 at the cheapest. I like Rattrap, but I don’t like him enough that I want to pay any markup for this figure. So I was quite pleased when I found him in store this month. The figure itself is not too shabby. As of this writing, I only transformed him once from robot to rat. I remember the transformation was somewhat complicated. I need to spend some more time with this figure. Leo Dux (Razorclaw) and Tigris (Rampage) from Mastermind Creations round out the rest of the figs this month. These are the last two needed to form Feral Rex (Predaking). Now that I have all 5 Feral Cons (Predacons), I think my favorite is Tigris. I feel he is the most fun to play with, and I really like both his modes. He’s also got some cool accessories. Leo Dux is cool too. Robot mode is especially nice, but the lion mode feels somewhat bulky. Primitives… answer the call! Transform and Roll Out! August is typically not a good month for finding new Transformers. In both 2012 and 2013, this month proved to be unproductive for TF hunting. Not so for 2014. Feast your optic sensors on all the goodies acquired August 2014. Let’s go over some stats first. 9 purchases for 10 figures total. 3 online purchases and 6 in-store purchases. 3 Generations figs, 3 AoE figs, 2 TF Prime figs, 1 MP fig, and 1 third party fig. 5 are Autobots, and 5 are bad guys from various factions (Decepticons, Predacons, Independents). Pretty good distribution overall. The Generations Thrilling 30 figures were a pleasant find. 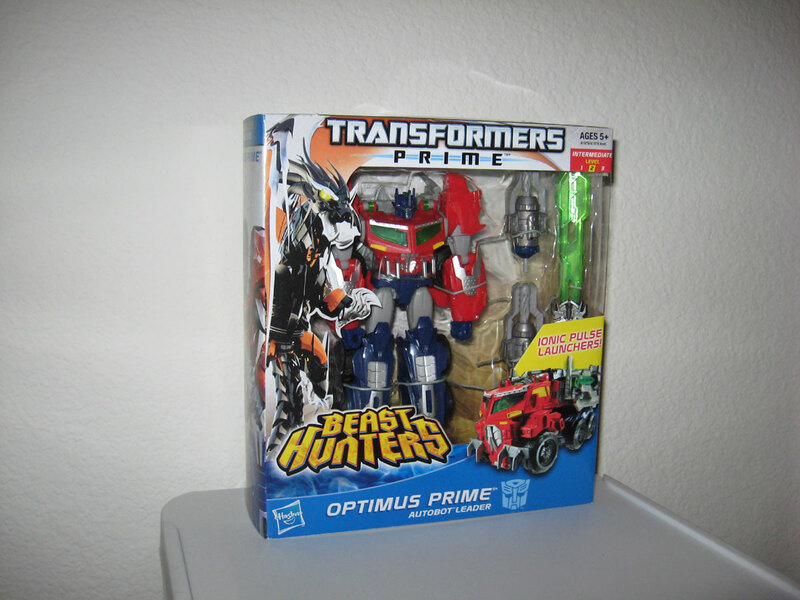 In the previous months, there weren’t any TFs on store shelves other than offerings from Age of Extinction. So seeing something from my favorite TF lineup is a sight for sore optics. Roadbuster was one figure I have wanted Hasbro to release for some time now. 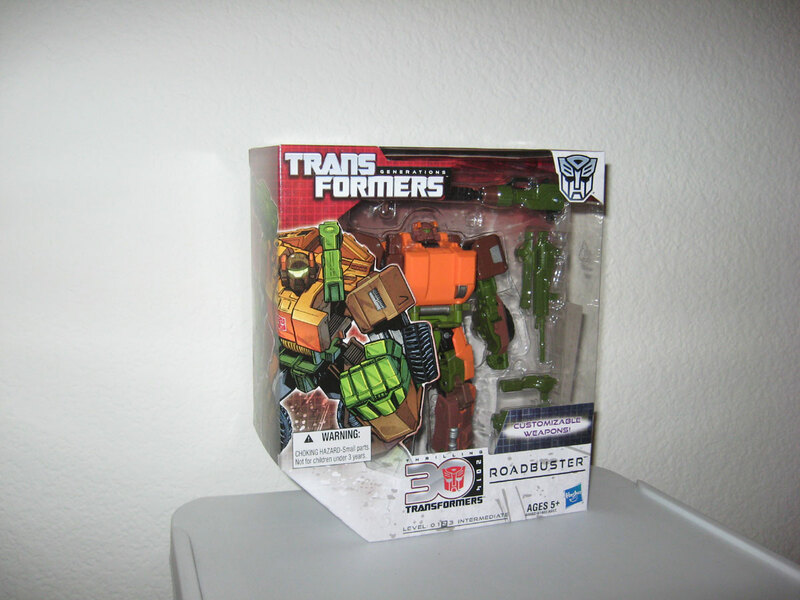 The Wreckers are always fan favorites, and Hasbro’s Roadbuster takes it one step further to completing this lineup (here’s to hoping they will do Broadside). There has been some third party Roadbusters, but I don’t want to pay those kind of prices on every fig. Hasbro Roadbuster is a solid figure. I like both the robot mode and alt mode. Transformation is simple yet fun. Appearance wise, Roadbuster retains his unmistakable G1 look. He’s got weapons galore! He will give AoE Hound a run for his money. Sky Byte are Tankor are characters that I do not recognize. 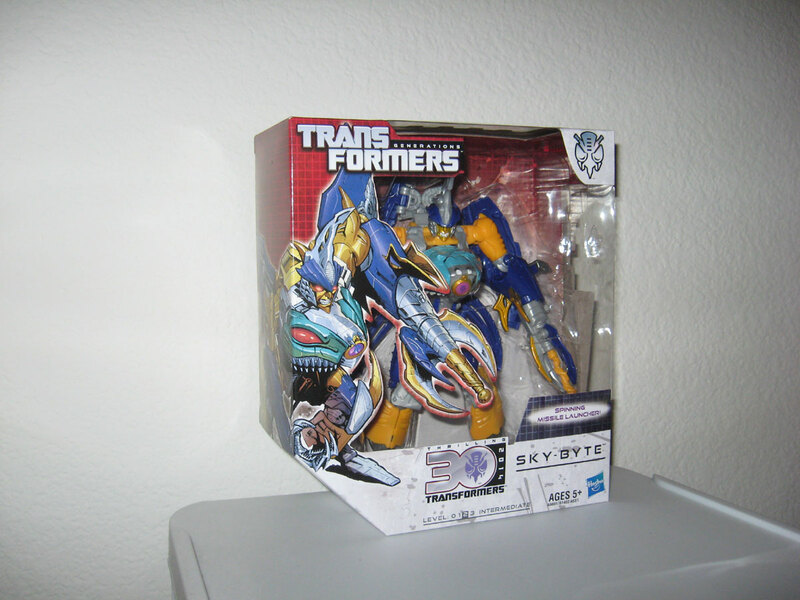 Out of all my Transformers, I don’t have any figures that transform into sharks, and that makes Sky Byte one-of-a-kind in my collection. The shark mode is pretty good too. In robot mode, Sky Byte could pass for a G1 Pretender Shell. Not exactly my cup of energon, but I can see some fans dig this. I am not at all familiar with Tankor. And no, this is not the Universe triple-changing Tankor that is a homage to Octane. This is a separate character, which I could tell you nothing about. This toy is… unique to say the least. He doesn’t particularly impress me in either mode. His appearance does not seem to fit into any of the TF continuities. This figure reminds me of an old 80s figure that I have. That figure is not a Transformer or a GoBot, but some other 3rd party line that was looking to cash in around the same time frame. I still have that figure at home somewhere. Maybe I’ll dig out that figure some day and compare it to Tankor in the future at some point. The only 3rd party figure this month is MMC Talon, which is an homage to G1 Divebomb of the Predacons. If memory serves, I pre-ordered this all the way back in January of 2013. Back then I never even heard of MMC. 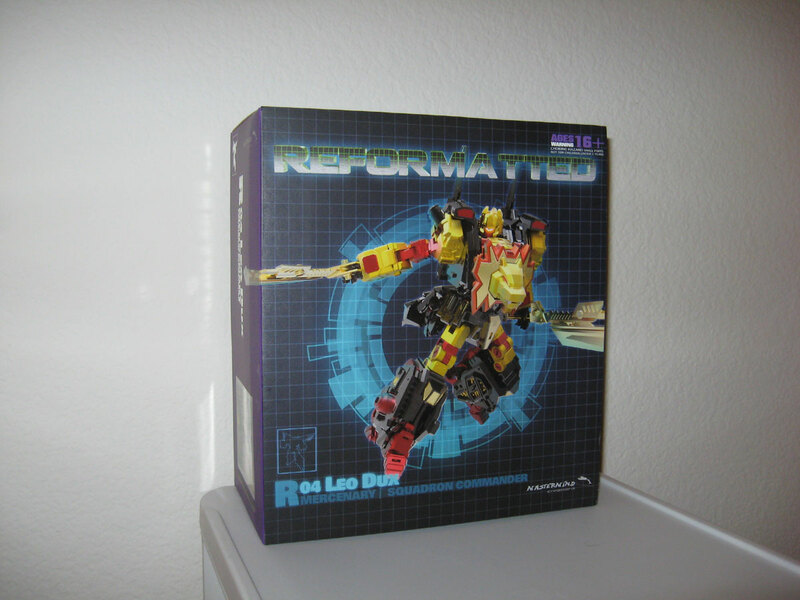 All I learned was that some new 3rd party is doing Predacons, so I pre-ordered instantly. Talon was supposed to be the first figure released in that lineup. But then I heard that something less than perfect happened with the manufacturing of the wings, and MMC really wanted to get it right, so they delayed it’s release. Props to MMC for their dedication to perfection. I haven’t actually played with Talon that much. He comes packaged in robot mode. Transformation to bird mode is pretty simple, if I remember right. I had both Bovis and Fortis before Talon arrived, and Leo Dux and Tigirs soon followed Talon’s release. So when that happened, I quickly transformed Talon to arm mode to form the fearsome Feral Rex (aka Predaking)! As of this writing I still have them combined. I think I will separate them soon, and play with them individually some more. 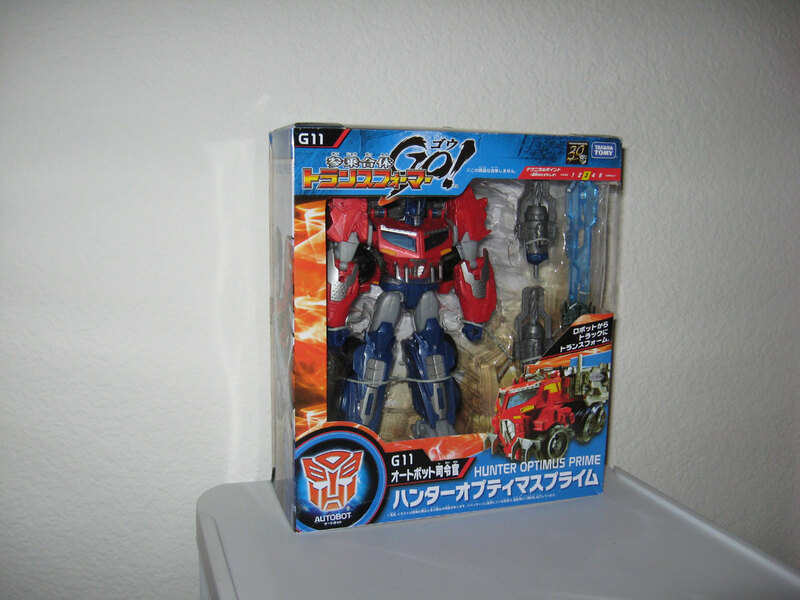 This month I got two Beast Hunter Optimus Prime figures from TF Prime, both the Japanese and US release. You might wonder why I did that. Back in May of 2013, I bought the US version of the fig. I really like this fig. 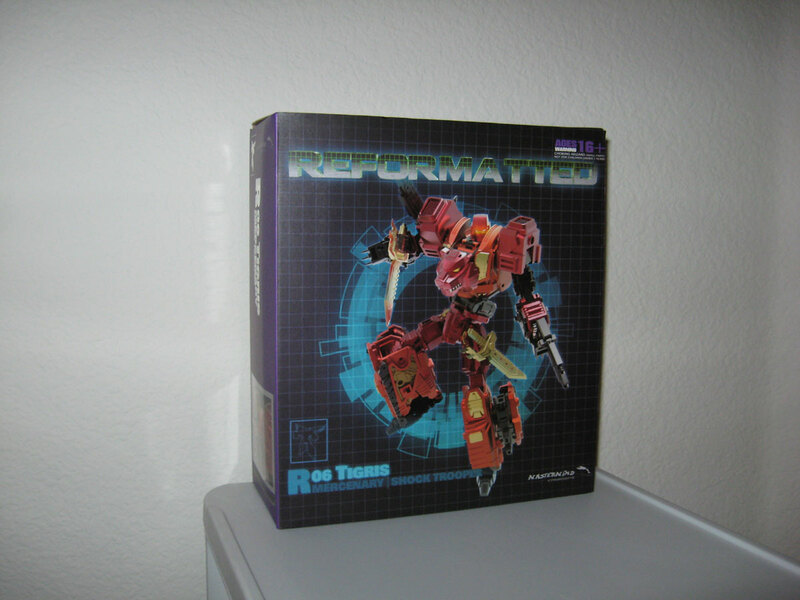 Both modes are nice, transformation is fun, and overall construction is sturdy. But furthermore, I bought this fig immediately after meeting the girl who would become my fiancee. I still remember that day well. We met at Starbucks and chatted for 3 hours. 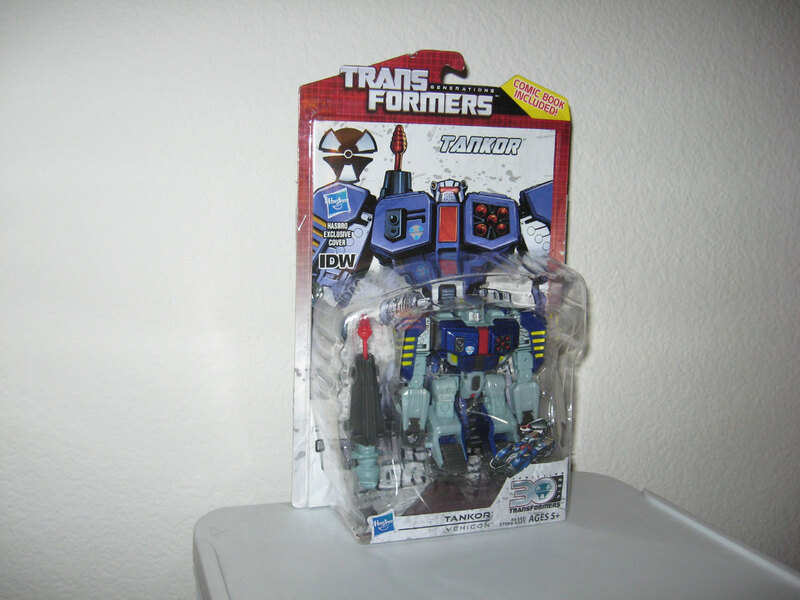 And in true TF geekness, right after I met up with her, I went to the nearby Walmart to hunt for TFs. That’s when I picked up this Beast Hunter OP. So yeah, this figure has sentimental value for me. Fast forward to July or August of 2014. I had the sword plugged into the right fist, which is a super tight fit. When I tried to remove the sword, the handle broke off from the sword, and now the handle is stuck in the fist. Apparently this is a common problem. My buddy Gemini had the same issue, and he had to heat up the fist to get the sword out. I wish I did that instead of trying to force the issue. Anyway, the fig is now imperfect. I don’t like any of my figs being imperfect, especially one that holds so much sentimental value for me. At first I looked at possible fixes. I know I can get a third party sword (which is better). But the handle is still stuck in the first, and there’s no way to remove it. And I can’t find any third party hands for this fig. So in the end I decided to bite the bullet and just get a new one. At first I got the Japanese version from Amazon. I chose this over the US version because of the more show-accurate blue sword, and to get the feeling I’m not buying the same thing again. But then I saw a US version of the fig on ebay for a good price, so I bought that too. I guess I went a little overboard. The AoE figures this month are Lockdown and the two Bumblebees. After watching TF4 with the GF (before she was my fiancee) at the theater, she remarked I should get the black Lambo. Of course she was referring to Lockdown. 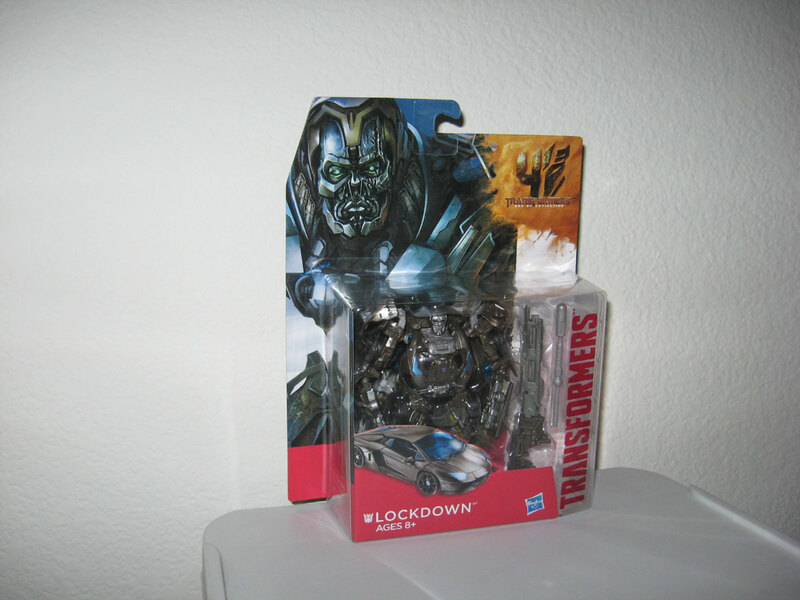 At the time, I wasn’t even sure if Hasbro would make a Lockdown in the AoE Generations subline. But they did eventually. The figure is not bad. The vehicle mode is nice, but I feel it could have been more black instead of this weird brown/grey color. Robot mode is ok. Arms are a bit too long in my opinion. The deluxe Camaro Bumblebee is not too shabby, but it really doesn’t offer anything new after all the deluxe Camaro Bumblebees that have been made in the first 3 movies. He’s not the best construction-wise, though. I already broke off a shoulder piece that forms the front corner bumper. 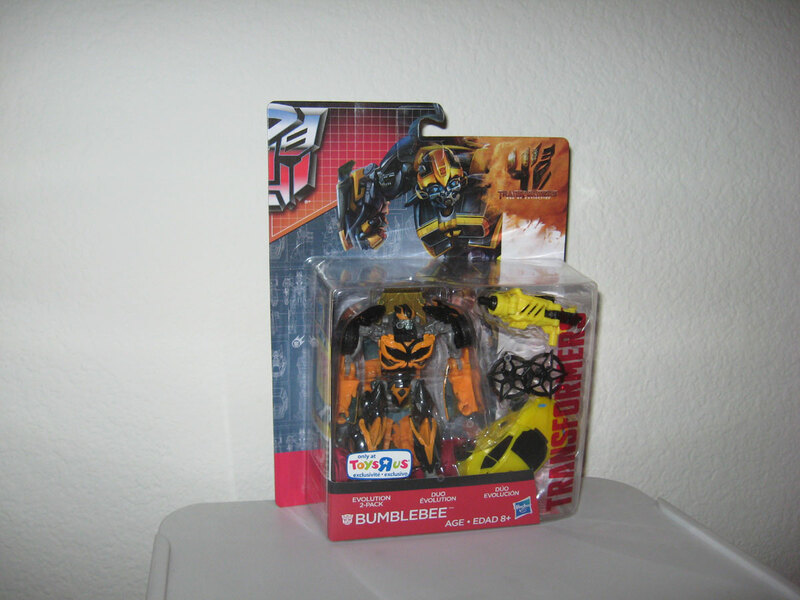 The little Bumblebee that came in the 2-pack is a repaint of the Generations Thrilling 30 Bumblebee. This Bumblebee is the one I featured in my last post. 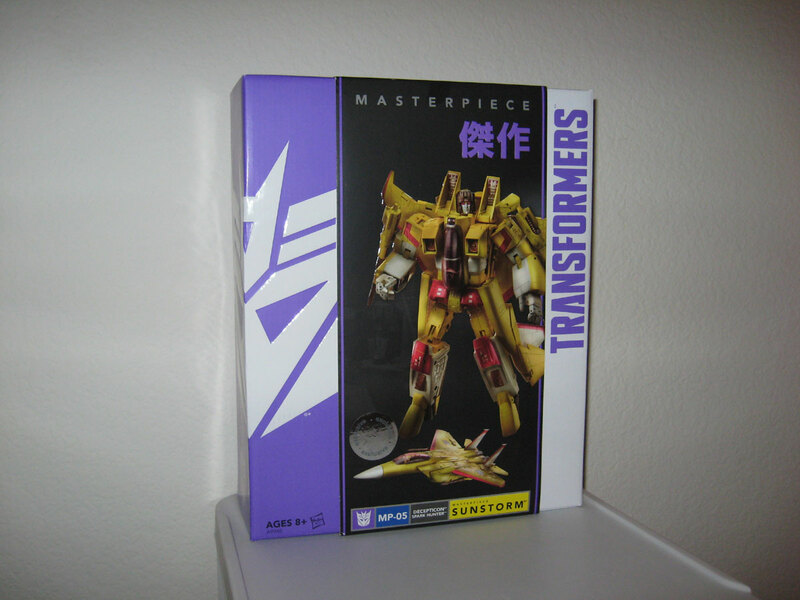 Last but not least, there’s Masterpiece Sunstorm. He is a repaint of the new MP Seeker mold with absolutely no new additions or enhancements. 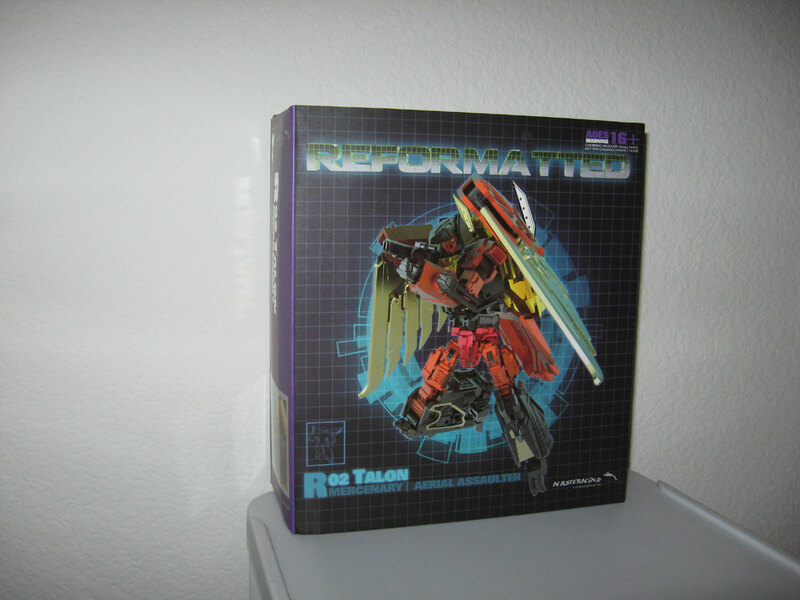 This mold was only released twice previously in the United States, once as Thundercracker and once as Acid Storm. These two were Toys R Us exclusives, and Sunstorm also continues that trend. As Sunstorm, some fans have complained of construction issues, specifically that the wings don’t stay attached to the back in robot mode. But mine seems just fine. I have done enough gushing over this mold in the past, so I will not repeat that here. OK… that was quite a lot of TFs. Next month it slows down. Can’t have this many figures every month, or I’ll go broke.